I take Christmas seriously. Anyone who has been to our home this time of year knows there is no surface left undecorated. The tree is always a focal point. 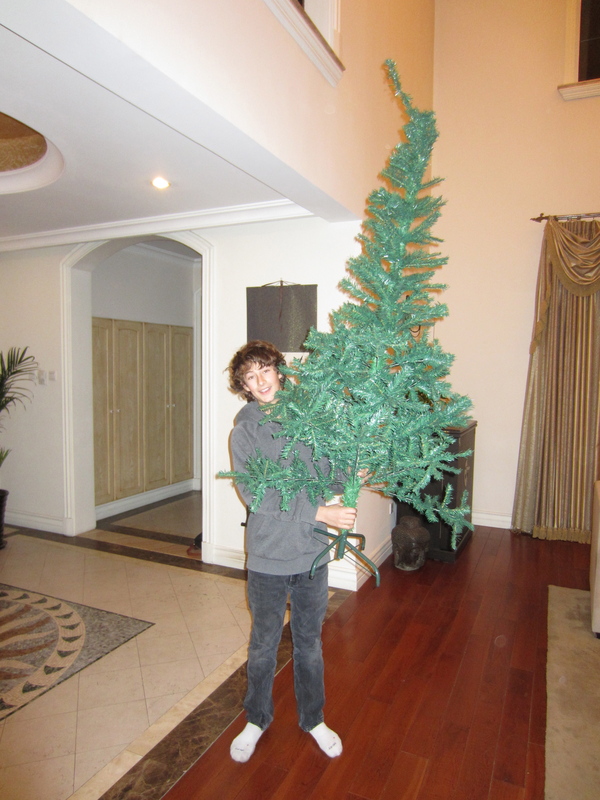 I buy the biggest tree possible for the house. It is always real. Always goes up early December. Always gone before New Year’s Eve. Our first Christmas in Bristol Gardens (London) I chose a gorgeous 14 foot high tree not realizing our ceilings were only 11 feet. I bought it at Clifton Nursery, owned by the Rothschild’s; located just 20 doors from our house. I paid a fortune, plus delivery! I have never confessed to John how much it cost. I never will. I had to chop off the top metre. It looked as though the tree just kept growing up into the second floor of the house. No space for the star on top! I have been collecting decorations for years. You can barely see green beneath everything we put on the tree. 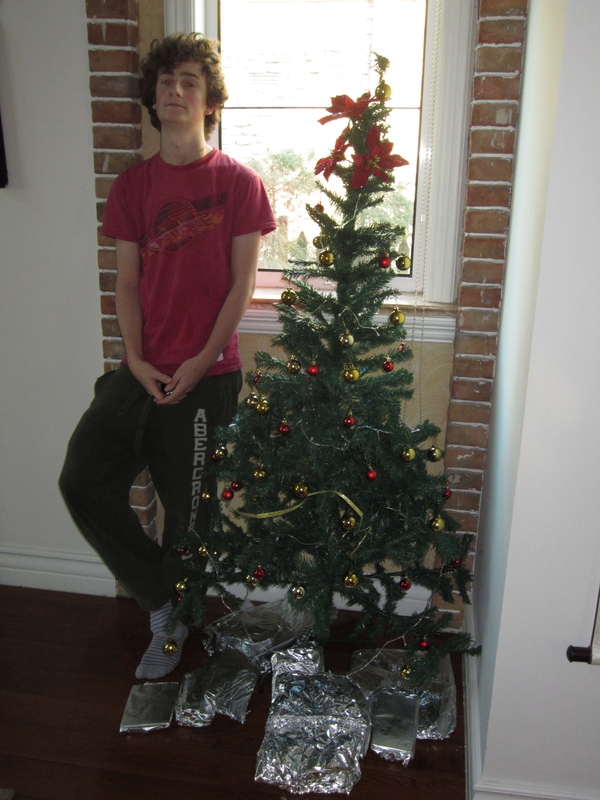 While we use lots of conventional ornaments, there are also all the treasures the boys have made over the years. We use a lot of bits from our travels: clay vegetables for Guatemala, hand of Fatimas from Morocco, Chinese endless knots, silk elephants from Thailand, Turkish evil eyes and a way too cutesy Mickey mouse key chain we were given in Japan. I fill bowls with my mother’s antique ornaments and use them for the centerpiece at dinner. However, since my parents died I have struggled with Christmas. It is the time of year when I still miss them painfully. As a child, I found it the most wonderful and exciting season. My aunt, whom I adored and for whom I was named, always came to New Jersey, bringing Canadian candy bars and Old Dutch salt and vinegar potato chips. As a family we had thousands of traditions and added more on a regular basis. And I loved getting presents! Lots of presents! We received one “big” gift but there were dozens of other packages under the tree, mostly junk or practical things. We wrapped everything, including deodorant. We baked special cookies, which we gave to friends and teachers, but there always lots left over well into January. My mother always cooked two geese, scalloped potatoes and tomato aspic. We were allowed to open one present Christmas Eve. Trying to decide which one occupied hours in the days leading up to the big event! I never appreciated how hard my mother worked to create this magic until I tried to duplicate it for my kids. I end up incredibly stressed trying to live up to my own expectations. John and the boys tip toe around me, trying to remember the various traditions, trying not to disappoint me, trying not to get snapped at. So this year we decided to skip Christmas. We are going to be in Laos. All our paraphernalia is still in boxes in Vancouver. No one needs (or even wants) anything! Perfect! No anxiety! Only I couldn’t do it. Tony (our wonderful driver) and I were heading down town when we passed, a normally empty, lot selling live trees. I told him I really wanted a Christmas tree. He explained that if he bought it, it would be much cheaper than if I did. So he dropped me at the hairdresser and went off to buy the tree. When I finished, he was standing beside the car looking as proud as a human being could look. I was wondering why I couldn’t see the tree in the back of the car. He threw open the trunk to reveal a plastic bag filed with what looked like big pipe cleaners. This was my tree. I gasped, swallowed and squeaked “how wonderful!” He was so thrilled that he had got the tree and a bag of gold balls, red flowers and a string of lights all for $25. We brought it home and he started to set it up. I started to cry. Fighting back tears, not wanting to hurt his feelings, I asked him to stop, explaining I wanted to put it together with the boys. We reminisced that only a year ago Hunter and Jack were reluctantly getting ready to move to Beijing. They talked about how scared they had been and how sad it was to leave their friends. Then they said how amazing this year has been, how much they’ve learned, how fun China is and how wonderful the people they have met are. When they told me how special this experience has been and how grateful they are that I dragged them, kicking and screaming, to Beijing, I started to cry again.